I hope everyone had a wonderful holiday weekend. Now it is back to the work week as Roa and I enter another week of therapies! We have not yet recieved our HBOT chamber, but after chatting with the girls at WI Hyperbarics, we know it is on the way.. shipped out Friday and should be here within a day or two. We are very excited to begin oxygen therapy again in the comfort of our own home! Many people have been asking about gifts for Rojo. We greatly appreciate your thoughtfulness in adding him to your Christmas list, but please, do not think that you have to purchase anything for him! Taking time to visit and play with him and talk with him is gift enough. The Thayer's are not "stuff people" as I like to refer to it. We don't need the latest hot toy or gadget that, I think, most Americans sadly focus their lives around. Christmas should be about family traditions, talking and getting to know each other, giving to people who are going without, and overall the birth of Jesus. But,... I won't get on my soapbox and preach about earthly posessions. But, some friends and family would like to generously give to little Roa and I thought we should post a few ideas. Again, thank you for even considering our family in your Christmas budget! Wind up toys, Koosh balls, tops, light up toys, small hand-held fun objects that Roa can focus on and reach for while working in his prone stander or at his highchair. Hanging mobiles. Roa loves the things that hang from the ceiling at his many therapy or doctor visits. We would like a few for around our home. Toys that are easily activated with a button, switch, or lever. Roa wants so badly to make the cause and effect toy operate HIMSELF! Music CDs and DVDs for Roa to listen to or watch while in the HBOT chamber. As costs of Roa's medical care, therapies, adaptive equipment rise, we have decided to take up Roa's Auntie Ellen's offer to open a savings/benefit account in Roa's name. We will respectfully be accepting donations for assistance in paying for the expenses of Roa's continued developmental progress. Details about where to send donations will be on our blog shortly. Seriously? Could you find a better therapy than "Lovin that pet o' mine"? Here is our one of our best therapist, Molly, hard at work in the backyard with her boy. Can you see the small portion of her tongue sticking out? Yep, that is Molly going in for the sensory stimulation technique of her choice while Bryan intervenes. Roa honestly is most movitated in life by Max and Molly. He constantly is giggling and wanting to get by them to play. We walk to the dogs, crawl to the dogs, kneel to pet the dogs! We think Roa is under the impression that he is part dog. If you encounter him and he grabs you, wide-mouthed and ready to bite on your arm, be prepared to go into full doggy wrestle match! We are waiting with anticipation for our new hyperbaric oxygen chamber to arrive at our home! We have finalized the deal with WI-HBOT center and have purchased their display model. Very nervous and excited to have a chamber at home to continue our oxygen therapy for Roa. The chamber should be here sometime this week so we are going to be busy this upcoming long holiday weekend with clearing a space in our basement to set it up. Our plan is to have Roa begin sessions right away in December. I know,... I have promised to post new videos of the boy and I haven't followed through! I will get at it soon! Roa and I continue to truck each Wednesday to ECFE class at Normady Park School. We run with our heads cut off (actually only I do the running) getting the bag packed, breakfast in us, dressed, bedheads combed, afo's and shoes on, in this season- hat, coat, mittens, ...and into the car. We skip the much-needed morning nap so that Roa can go to school and be "a big boy" and interact with the other kids. Roa seems to really like it. Pat plays with Roa while I do the parent part of the class. She says Roa watches everything and everybody at play! Taking it all in- that's our guy. The little questions running over and over... Why weren't we blessed with these toddler "problems" with Roa? When will it be my turn to ask how to battle these wonderful issues? Will it ever? As a special educator, I would have told me to "Speak up! Tell these other mothers what you are going through! Educate! " But it is too hard. Period. So, I will share with YOU because either you are visiting our blog because you are curious about our life or you are inspired by Roa's small triumphs. I will share with you that Roa makes a little squeal when we pull him around on a blanket ride through the house. Roa does a little full-body shimmy with excitement when we walk into his bedroom after his nap. Roa cannot hug or kiss, but does this sort of nuzzle and bite of my neck to show his love. 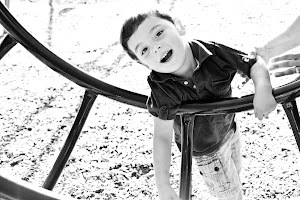 These are the things that keep my spirits up as I dream of tomorrow and the possiblity of a few typical toddler troubles in store for the Thayers. We have had a few therapists and people in Roa's world ask about his communication skills lately. Roa is almost 17 months. A typical developing child at his age would have 5-10 words that he could use confidently to communicate. Mama, Dada, Up, No, Cup, Truck, Ball, More.... all typical firsts. But, he doesn't talk yet. He yells, coos, laughs, babbles, screams, cries... but no consistent words. Are we worried? Yes, of course. But, after years of teaching Early Childhood Special Needs, I know that it will come. Give it time. We are doing the various communication "bag o' trick" methods- language rich environment, talking about EVERYTHING to him, reading and naming objects in books, giving him choices of objects so he can communicate his desire, working on YES/NO questions and the head shake. I am fluent in sign language and have signed to Roa to stimulate language since he was born! He does not nod yes or no yet. He does not sign familiar words yet. He listens intently. He watches every sign we make. And so we wait........ patiently. Exciting News spot for HBOT! Check out the above link! My BabyCenter friend, Jennifer, sent this link to me of their journey through HBOT. What a great story for them to share with the world! The botox is kicking in! 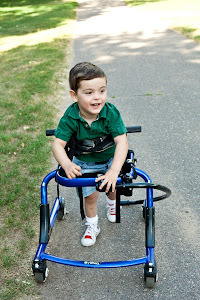 Roa is wobbly when walking, can sit with more ease, and his little thumbs are out! We are seeing some frustration with these muscle changes. He cannot stand for as long as he used to at the ottoman while playing. He goes limp in the legs and plops to the floor while walking with us. This does make him a bit mad. But, on a positive note, he is able to grab things and actually get them IN his little paws with those thumbs more useful! That has been surprising fun for Roa! Another perk is that, with the walking difficulty, we are working more on crawling and Roa is not fighting it as much. He is starting to move his arms and legs,...slowly, in a crawling pattern. That is exciting for us all. Craniosacral therapy has been great the past two weeks for Roa. We firmly believe that time with Kim and also with Angel in Minneapolis has really opened up something in his arms and shoulders. With that and the botox, Roa has been sleeping for 5 SOLID hours in a row!!!!!! LIFE HAS A NEW COLOR FOR MAMA! Today we are off to Dr. John, the chiropractor for an adjustment for Roa and myself. All this crawling is giving us BOTH some grief! We have cut out our Friday aquatic therapy time with Andrea. It is nice to have a day without a scheduled therapy. It is great for me to have that time to focus on working with Roa, myself- using my ol teacher bag of tricks along with following through with all the therapist's recommendations. I just had to post today that I got a message from Melissa, mom to Becca, who went through Hyperbaric Oxygen Therapy at the same time Roa did. Becca was born very premature, had medical issues, cerebral palsy, and was deaf. She is a bright, cute little 5 year old who moves around confidently in her power wheelchair and used sign to communicate. Well, since HBOT and their return back home, Melissa noticed Becca was more in tune to things. She took her to the doctor who told her to visit the audiologist. Becca is NOW HEARING in her right ear!! She is being fit for a hearing aide and will be able to hear almost completely in that ear! The audiologist gives credit to the HBOT! Miracles are happening, people, all around us everyday! Just open your eyes and count yourself lucky to be a part of it all! He had a great session yesterday with Kim, his craniosacral therapist, and Angel, a craniosacral therapist in Minneapolis who specializes in children. We saw so much peace and calmness go over Roa as they worked. It was amazing. Today Roa seems to be using his arms with more ease, opening his hands up to grab, reaching high above his head. It could be a combination of the botox and the cranio. work... whatever it is, I am RUNNING with it! Today we will work on that crawl, crawl, crawl!!! I wanted to give a quick update about Roa's botox treatments. He handled the injections very well. We have not seen any negative side effects. Actually, we have seen some very positive things- he is calmer, more attentive, sleeping better. He is unable to stand at the ottoman for as long as usual, his legs due seem weaker. He also is easier to place in a seated position on the floor with legs apart. This morning, however, Roa woke up at 4:00am laughing, wiggling and giggling in his crib!! What is up with that!? It was hard to take that early in the morning, but I will handle laughing over screaming ANY DAY! Yesterday, at ECFE, Roa and I were supposed to meet with the sales rep. from Reliable Medical to chat about adaptive equipment for someone Roa's size/age. Mary, Roa's PT, set this appointment up. Long story short, they were running behind schedule and Roa and I went to the Therapy Motor room to look for Mary. We met two of the other therapist who work for the White Bear Lake School District. They were nice and helpful in locating Mary and the sales rep. However, it was an interesting experience. Why,... you ask? Well, both of the therapist knew who Roa was. They said, "THIS is Roa!? HI! I've heard about Roa!" Now, ...I know I shouldn't be paranoid. (I also know that Roa's therapists and teacher READ this blog, so I should tell them not to take this personally) but, it is weird to hear that people you just met have heard of your child. My mind went to different places- Wow, they talk about Roa. Is it positive about how great he is doing? How aggressive his parents are in the fight for his development? Is it because he is cute, loveable, adorable? Is it because I am a ECSE teacher who was in a terrible car accident that might have resulted in his issues? Is it because I am a pain in the A*^ when it comes to questions and concerns? Is it because of his unique name? OR .. Is it because these therapists are preparing for the day that this "high needs" special child with cerebral palsy enters the school system and they will work with him? I used to teach. I know that teachers and therapist talk. I also know that you DO talk about the kids with high needs that are coming your way. Yesterday, when these strangers KNEW Roa,.. I freaked. I am so frightened for Roa's future. I ache to see him PLAY with other kids, TALK to me, MOVE on his own. I have stopped waking up and praying that today WILL BE THE DAY that he- crawls, sits, says Mama,... because it hurts when that special event doesn't happen on that day. I am being optimistic, yet realism has struck. There is a chance Roa will not do these things as quickly as we like. There is a chance these therapists WILL work with Roa when he is 3 or 4 on these skills. But until that day, I need to hold on to the hope that our current therapies and interventions ARE the answer. They WILL make all the difference in the world. Roa had his first round of Botox this morning at Gillette. He handled it all like a champ. Mom was the most worked up about it! But we all made it through! Roa couldn't have anything to eat since 5:30am and didn't get the Botox treatment until 11:00, so he was tired and hungry, but overall was in good spirits. They sedated him with nitrous oxide (laughing gas) and injected his thumbs, adductors, and hamstrings with botox. He remained just sleepy and calm through the procedure. After they gave him oxygen to bring him out of his sleepy state, he started to cry. I then could feed him and he was a hungry little monster! The doctor told us to watch for any reactions- flu like symptoms, redness, poor muscle control. He said the some of the affects of the botox will be seen in 1-3 days and the full affect on the muscle in 1-3 weeks. Roa may get more "wobbly" and might not be able to walk around with us like he is used to. We will wait and see how he handles the muscular changes!